I enjoyed walking around Naramachi neighborhood with my friends in kimono. Naramachi remains good old days. One of my friends rented nice cute kimono near the station. 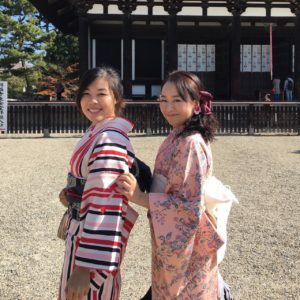 So, tourists can enjoy kimono day,too. At first, we went Koufukuji temple near the Nara park. It is a famous temple and one of World heritage. Please enjoy a nice autumn day in Nara, Kansai Japan. 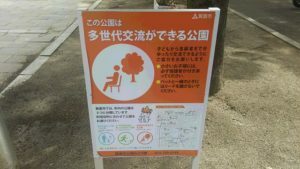 The otherday, I visited to the park in Minoo city. This is a mattar of course….. 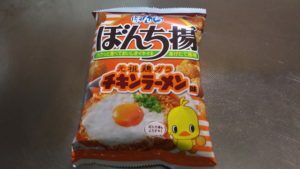 Please try to eat this one!! Hello, I’m Chiaki, the interpreter. I attended Oochamori, tea ceremony of big tea bowl at Saidaiji in Nara. Saidaiji is an old temple which has more than 1200 years history. 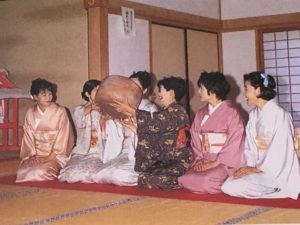 Since they are not allowed alcohol, they started holding ceremony with tea in Edo ara. They shared tea with all people visited them, they used a big tea bowl. Still now, they keep that event only twice a year. Having tea with a huge bowl with my friend’s help was lots of fun! 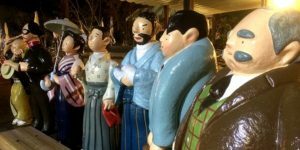 We have lots of places you can feel history here in Kansai. Please come and feel it! Hi, this is Kinoyann, the photographer. Coming back to Hyogo, I came to the mountain in Yumesaki-cho. ・・・night is best in summer. Under the moonlight is beautiful. Fireflies fly in the darkness. Thus one here, two there, flying by give weak light. Rain gives the good mood. 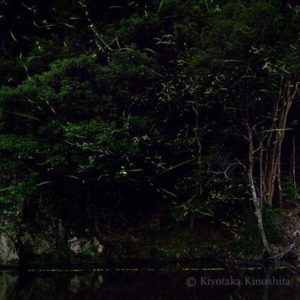 As you may see in the old poem of Sei Shounagon, we Japanese love the faint light of fireflies. Please feel our faint beauty here in Kansai. Hi, This is Kinoyann, the photographer. Here is characters in Bocchann. ”Bocchann” was written by Souseki Natume,a literary giant in Japan. The stage of this novel was in Dougonsenn, Matsue. You can enjoy the scenes of Bocchann there. Photo by Kinoyann, Kiyotaka Kinoshita. Hello, this is Kinoyann, the photographer. Here is the main building of Dougoonnsenn at Matuyama-shi, Ehime. Dougoonnsenn is the oldest hot spring which has the legend. It is about an egret. Once upon a time a white egret got injured and had cured in this hot spring. Photo by Kinoyann, Kiotaka Kinotaka. How do you enjoy spring in your place? 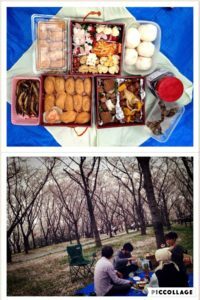 We, Japanese love to see cherry blossoms and have a picnic. I made a special lunch box what we call HanamiBento to enjoy the picnic. I made onigiri, inarisusshi, salad, hamburgers, rolled egg, and so on. Why don’t you join our party? Spring in the old castle. I walked around Tatusno where I spent my school days the other day. Tastuno Castle is one of　the oldest castles in Japan. Some of you may have hered the name of Kuroda Kanbei, the famous Samurai. This castle used to be his. 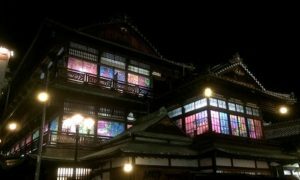 Tatsuno is known as a little Kyoto, too. It is a calm and lovely city and very good to take a walk. Hello, this is Kinoyann, a new comer. I am a photographer. I go all over Japan to take shots of Japanese traditional scene. Here, I am going to introduce not only Kansai, but all over Japan. It is my pleasure to let you know about Japan including Kansai. 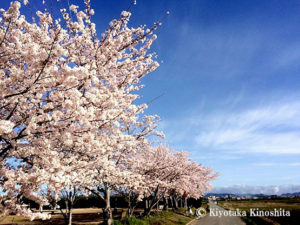 My first photo is cherry blossoms in spring. Please enjoy Japanese spring from my neighbor, Kobe.